← Menopause: Joyous Journey or Walk through Hell? You say, “cocoa”, I say, “cacao”. Any way you say it, the raw bean from which chocolate is made has a ton of health benefits. It’s also delicious, especially if you like your chocolate on the bitter side. When we think of chocolate, most of us envision the Kit Kat bar that calls our name as we check out at the grocery store! If you read the ingredients on their labels you’ll discover that these bars are far from chocolate. Typically the first ingredient is sugar and then you find milk, cocoa butter, and other natural and artificial ingredients. These chocolate bars contain a lot of sugar and may have little of the cacao polyphenol benefits found in raw cacao. 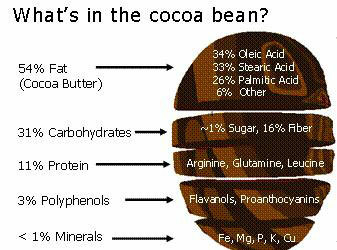 Generally, the more the cacao is processed, the fewer of the health benefits it retains. Cacao beans grow in pods on small trees (named Theobroma cacao). 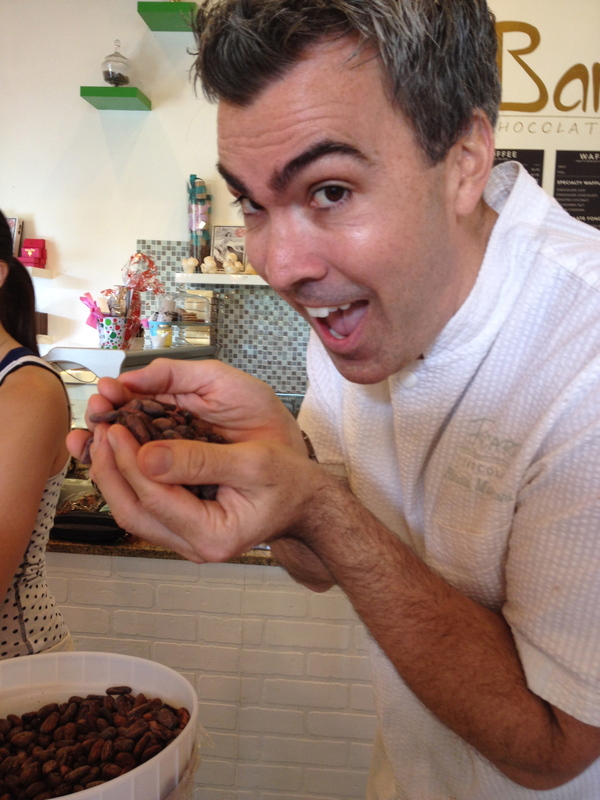 When the beans, which have been fermented and dried, are roasted, de-shelled and cracked, they are called cacao nibs. These nibs can be used for baking, cooking or just eaten as they are. 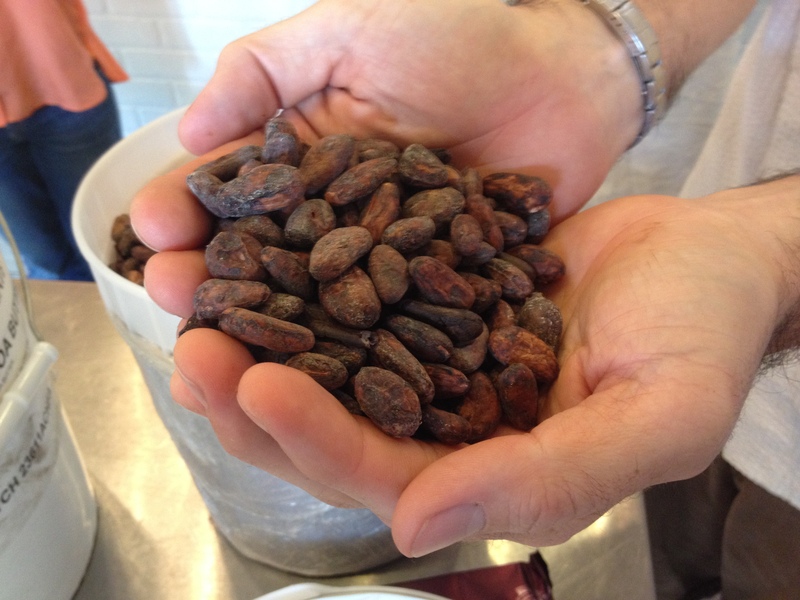 The cacao nibs are also further processed to produce cacao liquor (or mass) and powder. Manufacturers turn these into all types of chocolates when they combine them with cocoa butter, sugar, and other ingredients. The processing of cacao beans affect the extent to which the beans retain their health benefits. If you’d like to learn more about growing and harvesting cacao beans and the process of making chocolate, read about a cacao micro farm and small chocolate factory in Oahu, Hawaii (Madre Chocolate). Contain plenty of vitamins: E, B2, B1, B5, B3, and B9 and small amounts of vitamin A and C.
We love the visual breakdown of the cocoa bean’s content, provided by Built Lean on their site at http://www.builtlean.com/2012/04/12/raw-chocolate/#fn-7774-4. have anti-inflammatory and anti-carcinogenic effects. One paper analyzing the results of several studies on the beneficial effects of cocoa polyphenols on human health reported that “on a per serving basis, cocoa has higher flavonoid content and antioxidant capacity than red wine (2 times), green tea (2-3 times) and black tea (4-5 times), respectively.” (1) p. 4. This same paper also reviewed studies that suggested that cocoa may help with tooth health by reducing tooth decay, have anti-obesity effects, reduce the symptoms of chronic fatigue syndrome, help with inflammatory bowel disease, help delay age-related brain impairments, and have positive effects on skin tone and elasticity (when applied to skin rather than consumed). (1) pp. 14-18. This might explain why Valentine’s Day is a popular time for chocolate gift-giving. 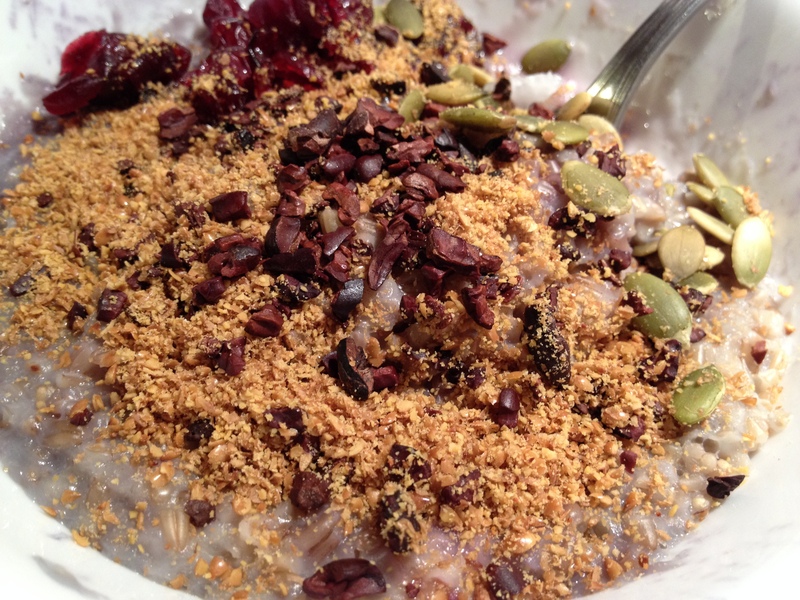 If you’re planning a romantic dinner, try adding cacao nibs to the menu! You can buy pre-packaged and ‘bulk” cacao nibs at health food stores like Planet Organic, Whole Foods, Amaranth. Even President’s Choice Superstore and Loblaw’s carries them. An interesting combination of cacao nibs and zucchini on a pasta using an absorption method of cooking the pasta. Looks good and will try it ourselves! 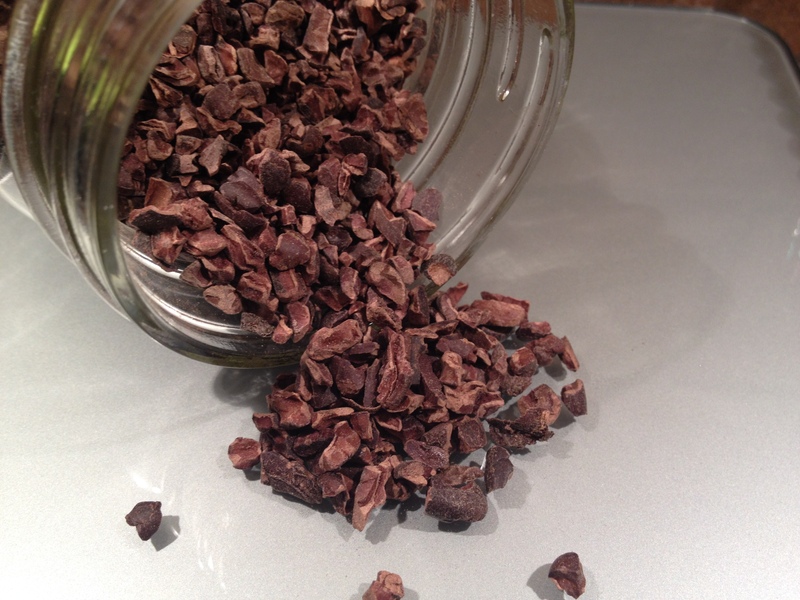 If you love cacao nibs and have used them in your recipes, please share them with us. We’d be happy to post them for all of our followers to try. This entry was posted in Weekly Blogs and tagged antioxidants, cacao, cacao nibs, cardiovascular health, immune system, polyphenols. Bookmark the permalink.